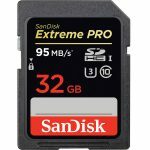 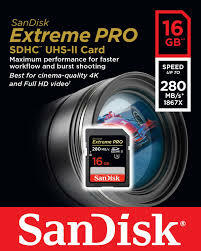 Designed for professional photographers and videographers, the 16GB Extreme PRO UHS-II SDHC Memory Card from SanDisk features a storage capacity of 16GB and takes advantage of the UHS-II bus to support advanced DSLR functions such as continuous shutter bursts and rapid shooting, as well as RAW and JPEG captures. 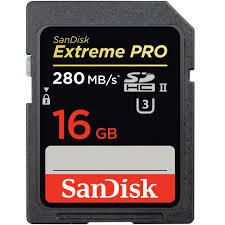 This card is also well-suited for video capture, including 4K, 3D, and Full HD video, and can achieve maximum read speeds of up to 280 MB/s and maximum write speeds of up to 250 MB/s. 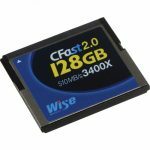 Thanks to its U3 speed class rating, minimum write speeds are guaranteed not to drop below 30 MB/s.